Back to work already, were does the time go!!!! It’s always hard to get back into the swing of things after a holiday. If you are one of those folks back at work already after the holiday, then I share your pain. Hopefully you all had a wonderful holiday, as I did! Before all the holiday craziness my boyfriend and I went out one night and we ended up ordering a dram of a single malt I had never heard of, before this instance. 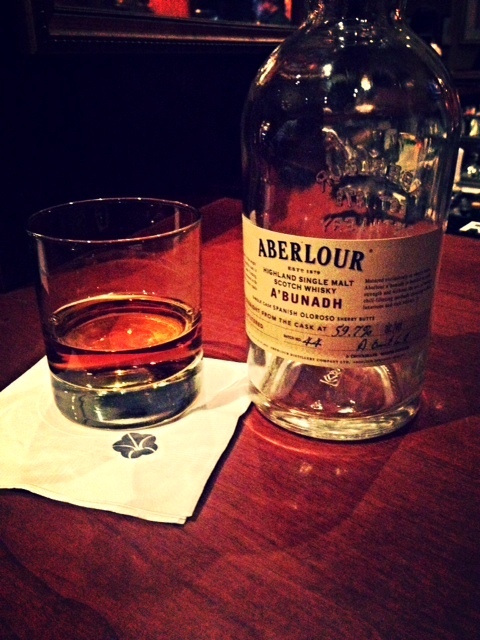 That single malt was Aberlour A’Bunadh. Arbelour is a Highland single malt that is made in Arbelour, Scotland, so the whisky itself is named after the place it’s made from. According to their website the Gaelic meaning for the word Arbelour is ‘the mouth of the chattering burn’. Aside from the A’Bunadh which is matured in Spanish Oloroso sherry butts, in their range you will find a double cask 12 year-old, double cask 16 year-old, 18 year-old, 12 year-old sherry cask and a 15 year-old double cask. For my non whisky drinkers if you are wondering what double casks means, in Arbelour’s instance, they mature their product in bourbon casks and Oloroso Sherry Butts. After they are properly matured, they take the whisky matured in the bourbon casks and they marry it with the whisky in the Oloroso Sherry Butts, blending them together to create their brand. Palate: It was an incredibly creamy scotch. It’s one of the creamiest I’ve ever had. It was smooth, sweet and I could also taste the sherry. I was very pleasantly surprised by the A’Bunadh. It is a single malt I would recommend trying if you haven’t already. They marrying of the two casks is done so harmoniously, you can’t help but love the experience. If you are looking for a creamy whisky then this would be it! If you’ve had this one of any others in their range let me know your thoughts on them. I would certainly love to hear about your experience!